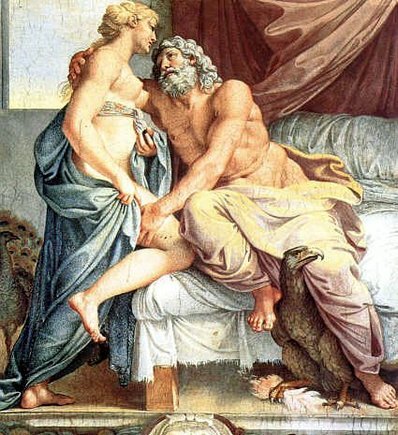 January 18 is the Sacred Marriage Day of Zeus and Hera. It is a good time to give honor to current relationships, and to honor your partner. Think about ways that you can attain a healthy relationship. What have you done right or wrong in the past year, and what you can do in the future to be a better partner? If you are single it is a great time to honor the union of your parents. Before you begin your Ritual, take a purifying bath scented with an appropriate essential oil, perfume, or bath salts. Hera and Zeus, please accept my humble offering to you. I stand before the Gods to honor them on thieir sacred wedding day. I shall sing of Hera, beautiful bride of Zeus, Goddess of the sky and starry heavens. She wears a crown upon Her head and holds the royal lotus-tipped staff. Lady Protector of women and marriage, who is Queen of all Olympia, I give you honor. His tight-knit schemes to Themis as she sits leaning upon him. Have mercy, far seeing Kronides, most glorious and great! Breathe deeply for a few moments, and then speak to Hera in your own words. Tell Her of your wishes for true love, marriage, and partnership. Express your desire to honor Her sacred vows of marriage to Zeus by respecting your own vows and promises. Be sure to take the time to listen to what She has to say to you. She may not speak to you in actual words so pay attention to what you are feeling both physically and emotionally. Take heed of your thoughts and of sounds that are happening around you. The Goddess may manifest with subtlety and it is up to you to pick up the messages that She may send to you. I bring you gifts on your sacred wedding day. May you partake of them through me. Eat the honey cake except for one bite, which is placed in the offering dish. With You Lady Hera, I share the first! With you mighty Zeus, I share the second! With you Lady Hera I share the first and last, I share the last! Hold up the glass of wine, and then pour the rest into the offering bowl. Thank the Goddess and God for their presence at your ritual. Extinguish the candles. Take the offering bowl outside and pour it upon the ground.